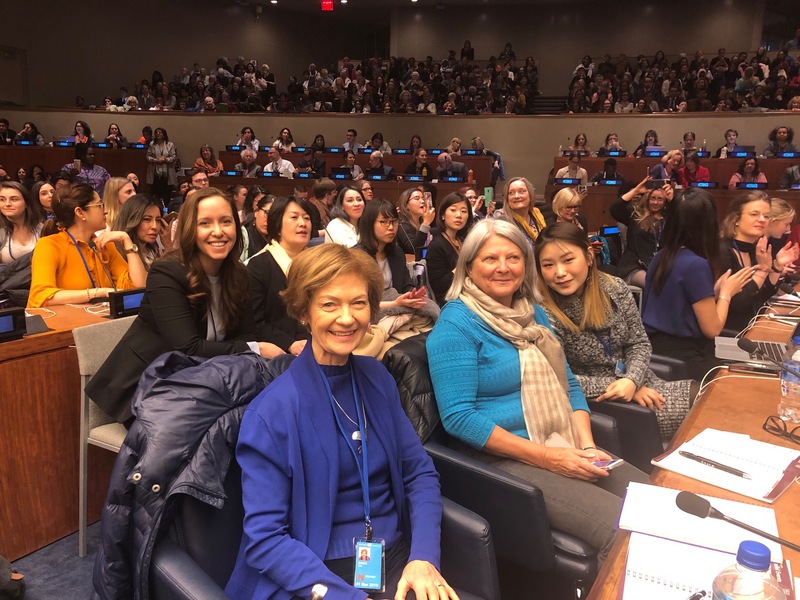 Even though I have been working in international development for over a decade, I have never been to a United Nations assembly, so I was very excited to be part of the BCCIC team attending the 63rd UN session on the Commission on the Status of Women (CSW 63). In preparation, I read the Beijing Declaration adopted in 1995 by 189 countries. I was impressed how visionary the document is. It imagines a world where women and girls could exercise full and equal rights, freedoms and choices in their everyday lives, and provides a roadmap for achievement. This document is still as relevant today as it was then. It is with this perspective that I attended the town hall meeting with the UN Secretary General, Antonio Guterres. Mr. Guterres was previously the United Nations High Commissioner for Refugees, and before that was the Prime Minister of Portugal. The Portuguese public ranked him as the best Prime Minister of the previous 30 years. Prior to his entrance in the room, women from around the world were singing inspirational songs from their countries, including “we shall overcome”. The Secretary General told us that gender equality is one of his top priorities. There is much evidence that when women are at the table, better and more sustainable decisions are made. There have been many gains for women over the years, however, some of these gains are being eroded due to the current economic, social and political climate. Economic inequality has grown between and within countries. Austerity measures have eroded social protection for women and girls. Mr. Guterres told us to “push back against the push back”. He said that the central question of gender equality is power in a male dominated world and a male dominated culture. “Power is not given, but taken”, he said. Therefore, it is important for the UN and civil society organizations to push back against reversals in gender equality. Vera Radyo (at the front in blue), as well as BCCIC Delegates Tanya Wragg-Morris (to the left in black) and Danielle Luo (to the right in grey), attend the annual Civil Society Townhall at the CSW63. 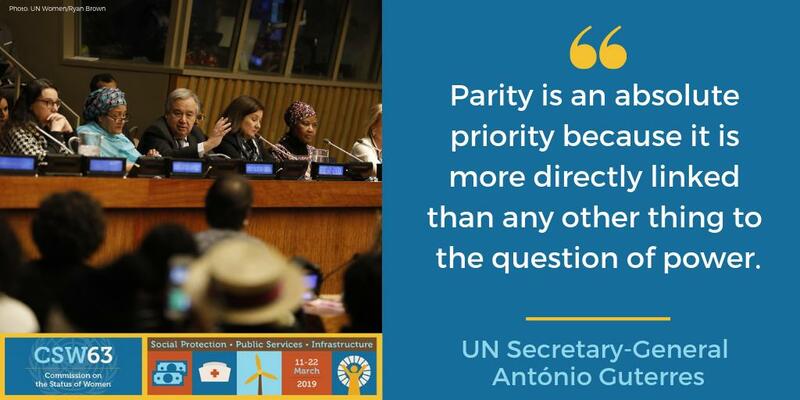 Gender parity in UN staff – the UN is well on the way to gender parity with 53% men and 47% women in UN staff (excluding UN peacekeeping forces); and there is now gender parity in senior leadership. The fight against sexual harassment within the UN with a policy of zero tolerance. The UN now has 6 female complaint investigators, who are all experts in sexual harassment. Thus sexual harassment complaints are taken out of the traditional chain of command and dealt with by experts in the field. Zero tolerance of sexual harassment in the field, including with peacekeepers and refugee resettlement, where he indicated that there is a high potential for abuse. Violence against women in conflict situations – a very serious issue that is not improving. The increasing persecution of human rights defenders– there are more attacks and vicious campaigns against human rights defenders world wide. The Secretary General again reinforced the need to “push back against the push back” with political activity and strong civil society participation. He saw civil society as an important ally to the UN in working towards gender equality. A Ugandan woman talked about the difficulties when she was a refugee in the DRC. To each of these women, the Secretary General responded compassionately and directly. For some situations, there are no clear answers, only ongoing struggles. I left the session feeling hopeful and optimistic! Yes, there are many serious problems in the world. However, there are many amazing women, and many amazing organizations that are working to tackle these problems. And the Secretary General is our ally to help make the world a better place so that “no one is left behind”.